According to VDOT's website concerning an improvement project along VA 5, US Bike Routes were signed in Virginia in the "early 1980's". 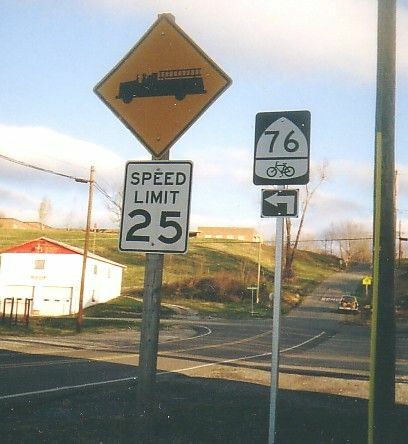 There are two such routes in Virginia that are signed - 1 and 76. Each is part of a named bicycle trail that spans multiple states. Information on the overall system in America is limited. In my own experience, the only other state I know of for sure that posts their US Bike Routes is North Carolina, which posts its portions of US Bike 1. As for Virginia, I personally saw these posted for the first time in 1987 on a visit from South Carolina. In general these routes are fairly well posted, though there are exceptions (such as City of Richmond). Additionally, it is possible to drive a car on nearly all of the bike routes (the two places I know you cannot are both on US Bike 1). Listed below are the route logs and turns required to follow the routes. These routes are not on any maps except the bound VDOT atlases. DeLorme Gazateers for Virginia also do not show them, though they do in their North Carolina atlas. The routings described below were taken from the 1995 VDOT County Atlas - be aware that changes to the routing are possible and that signage might not be as good as one would hope in the field. Incidentally, as far as I know there is no state network of bicycle routes (unlike North Carolina), and the only set of posted bike route numbers I am aware of in Virginia besides the US Bike routes is the City of Newport News. 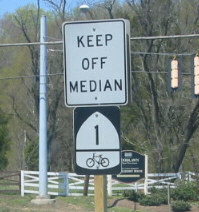 Bold entries are points at which the bike route follows a new primary/secondary route. non-bold entries are primary routes crossed, for reference purposes. NOTE: THE BRIDGE OVER THE OCCOQUAN RIVER ALONG US BIKE 1 IS CLOSED TO VEHICULAR TRAFFIC. USE VA 123 TO FIRST STOPLIGHT ACROSS OCCOQUAN RIVER. TURN RIGHT AND FOLLOW TO SR 2100.